The generalized k-server problem is a far-reaching extension of the k-server problem with several applications. Here, each server si lies in its own metric space Mi. A request is a ktuple r = (r1; r2; : : : ; rk) and to serve it, we need to move some server si to the point ri ϵ Mi, and the goal is to minimize the total distance traveled by the servers. Despite much work, no f(k)-competitive algorithm is known for the problem for k > ϵ servers, even for special cases such as uniform metrics and lines. Here, we consider the problem in uniform metrics and give the first f(k)-competitive algorithms for general k. In particular, we obtain deterministic and randomized algorithms with competitive ratio k > 2k and O(k3 log k) respectively. Our deterministic bound is based on a novel application of the polynomial method to online algorithms, and essentially matches the long-known lower bound of 2k -1. 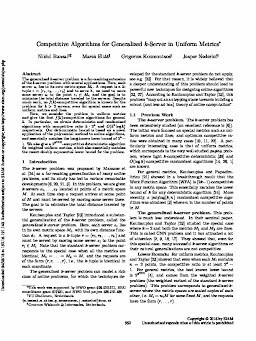 We also give a 22O(k) -competitive deterministic algorithm for weighted uniform metrics, which also essentially matches the recent doubly exponential lower bound for the problem.